Excellent new release from this ever-changing group. No two releases have been quite the same and this one is no exception. This time out the recording is group improvisations featuring leader/founder Henry Krutzen on tenor sax, piano & percussion. The rest of the group is Marcilio Onofre on piano, Alexandre Johnson on flute & G flute, and Markus Stauss on bass saxophone with special guests Kizambe, Dudu Campos & Sami Tarik on percussion, Darlan Marley on drums,and Antonio de Padua on trumpet & slide trumpet, . The recording is superb. Every instrument is clear & beautifully set in the mix. The performances are breathtaking! These players define improvisation. The improvs become compositions as the listener will not perceive them as random or disjointed but rather a similar experience to hearing well thought-out compositions. While there are certainly elements of jazz inherent in any fully improvisational outing it should be said that this is not what most people think of as 'jazz'. Some of it recalls the compositions of 20th century composers like George Crumb or Paul Chihara. At other points it reminds one of the improvisations of groups like Henry Cow or Samla Mammas Manna. The 'fourth world' music of Jon Hassell comes to mind occasionally as well. This music does transport you to another place entirely. Positively mesmerizing! 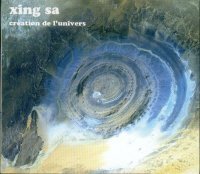 Xing Sa "Creation de l'Univers"
Notify me of updates to Finnegans Wake "The Bird & the Sky Above"